Original works of art are a wonderful way to capture a memory. 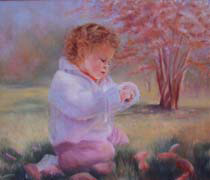 As a portrait artist, I paint a variety of subjects, including children, adults, and pets. I was born and raised in Niagara Falls, where I began sketching portraits of friends and family at an early age. Through art courses and many hours of practice, I learned the use of oils, watercolors and pencil techniques. 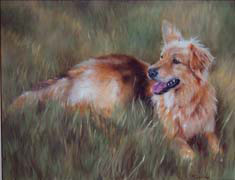 As my reputation as an artist grew, I began to accept commissions and to display my art in local galleries and shows. I prefer to work from photographs and am currently accepting commissions for portraits. Before I begin a portrait, I try to meet the subject, to get a sense of the personality, true skin tones, and facial features. During this meeting I take several photographs and make notes on colors and composition. I use brushes for oil portraits and blend the colors to create a delicate style. The three photographs I have submitted to the Portrait Society are an example of this style. I believe a portrait should capture the subject?s likeness, personality, and character, and convey that to the viewer in the composition, colors and brushwork. I use all these to create a portrait that is pleasing to the eye, but also captures the essence of the subject. 14" x 18" 20" x 24" 18" x 24"